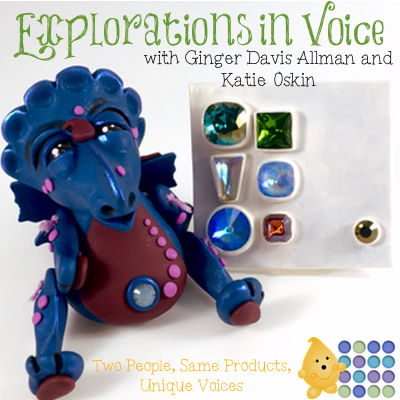 Explorations in Voice a collaborative project with Ginger Davis Allman from The Blue Bottle Tree. Explorations in Voice is a joint collaboration in projects, materials, and supplies for polymer clay. Ginger and I have become friends over the past several years, especially the past year; Explorations in Voice is a result of that friendship. Together we worked out a collaboration along with all the details to make that happen. And do you know what? Exactly what I thought would happen when we got together, happened. We couldn’t stop laughing, chatting about clay, fountain pens & planners (don’t get us started, we don’t tend to stop on this one), life, and even tried to solve the world’s biggest problems. While we didn’t succeed at that, we sure did have a good time working on our collaboration. I know we’ve been keeping it under wraps for quite awhile, but today you get to come along on the journey. So the idea was that we would reach out to a few suppliers of yummy things to use on clay, with clay, for clay … basically, it’s all about the clay, baby!!!! We wanted to see where our “voice” in polymer clay would take us if we were given the same supplies. We were so blessed to have 4 wonderful sponsors: B’Sue Boutiques, Christi Friesen, Lisa Pavelka, & Tiny Pandora. Each of these sponsors sent 3 sets of supplies. They were identical. Why 3 sets you ask? Well because ONE SET is for a lucky winner [giveaway is below]. Over 2 days, Ginger & I sat down in her studio and created and created and created. We worked for about 16 hours in that lovely studio. And not only did we have a great time, we learned a few things along the way too. We learned about each other, got frustrated because being the boss of clay in 100+ degree weather can be … well, challenging. The products that were sent to us by our four sponsors were absolutely fun and in some cases very challenging. Between the two of us, we were able to use everything that was sent in our boxes and after 16 hours, we still had plenty of supplies left over. While Ginger did not have time to cane and use the CaneBenders, CaneCaps, & Square Pairs, from TinyPandora, I had that opportunity. [You can read my full review of CaneBenders here.] While she found the time to use the Lisa Pavelka stamp, I did not; but I did get to use the butterfly punches. Sometimes finding creative ways to use products is half the challenge. My dragon, Bloue, used the butterfly punches as wings for example; I also used the border molds as a background setting for my brooch. Ginger made a gorgeous triangle brooch with white clay tinted with the Christi Friesen CRASH Surface FX. Likewise, I used a tulip bead cap from B’Sue Boutiques as a way to make my tin stand up. Additionally, the large flower from B’Sue, I cut in half (yes, you can cut through brass) and used half a flower on four different projects: tin (2 flower halves), steampunk dude, floral brooch. The entire contents of the picture at left! A box filled with delicious polymer clay supplies from our sponsors listed below. Thank you for all of you who entered and participated in the giveaway, it was a great success. Great project! Wonderful give away. I absolutely loved seeing the two of you together! Ginger, you are a natural on camera! Boy that would be a great prize… thanks to all the vendors that donated. What a cool set of products to sit down with and use so creatively!! What pasta /clay machine do you recommend? I have had several, but right now I have an old Atlas that I dearly love. The new ones are not the same and are not nearly as reliable as the older models. How can u keep white clay white? How long do you think it takes, or how much exposure does it take for someone’s voice to be individual? With all the issues with copyright etc. do we expect too much originality when so much is accessible of others’ works through the internet etc.? Wonderful event and giveaway, thank you so much! Being a long time reader on Ginger’s blog leave me with really few questions. One of this is: I know you can’t use nail polish on PC… BUT how about sealing the cured clay before applying it? Could work or not? How do you prevent finger prints & nail marks or do you do something to remove them later? I hate wearing gloves because they seem to get in the way. I also do not like wearing gloves. I actually don’t wear them at all. I love how you share tutorials for free !!! Thank you all I have see, read and hear today and what great giveaway! How do u deal with fingerprints? Woo whoo who doesn’t love a give away? Especially with awesome things!!!! really huge giveaway 😀 let’s try!!! i have difficulty in finding rubbing alcohol in italy (you can’t find it anywhere)…and etilic alcohol doesn’t work well for cleaning alcohol inks…what i can do? What a wonderful prize! I wish to thank you for your information. It is most helpful. Love the give a way! thanks for the opportunity to get a chance at getting it! Have you ever tried mixing different brands of clay together? It’s something I’ve always meant to experiment with : what happens when I blend two different brands of clay together? Do they cure properly? Will the resulting blend take on qualities of both brands? Will it be fragile? Will the colours properly blend? Might be something that Ginger has already experimented with. Thanks for the wonderful giveaway. In making round polymer beads, what is the best or easiest way to keep them round instead of semi-round? Does baking in the smaller ovens make any difference as long as the temp is correct? Do you always mix your own colours? I see some people insist on it! Different strokes for different folks, as the saying goes. Would love to win this!!! Thanks for the chance. I read Ginger’s blog about your visit and projects together. Sounds like a blast! Thanks to everyone involved for the giveaway! My question is: How do you apply a sealer to something that has a surface treatment or inclusion without smearing/moving it? What is the best clay for modeling? Like fairies or Angels. Thank you for the opportunity. It’s always fun to see how different artists create using the same supplies or inspiration: thirty people will do thirty different things. Thank you for sharing. Hi Joanie, Properly baked polymer clay should have a little give/flex to it after baking. If it easily snapped in the middle, your clay has not been baked at the proper temperature. Be sure to use an oven thermometer to double check your oven is baking at the temperature you have it set at. I bake NOTHING in my studio for less than 45 minutes. I hope this helps. What an amazing gift for one lucky person, so many wonderful things to be made & hours of fun to be had. Ginger’s done so many good info items that it’s hard to think of a question she hasn’t answered for me. Since Fimo gave away their professional kit with the color wheel/mixing chart, I have been wondering how hard it is to mix and get good results from Premo (my preferred PC) or even Sculpey. Wonder if there are some tricks or a rule of thumb to get better results than I am getting (which is a lot of muddy colors)? What you and Ginger did together is inspirational! It would be fun to do this at the Polymer Clay Guild meeting I attend. Thanks to all for the give-aways!! I’d love to win and try some new products! Thanks!! Hi! Thanks for the chance to win. In this moment I haven’t a specific question about polymer clay, but I think that the right way to cure clay would be a great argument to develope. Sorry for my english. Have a great day! Love seeing what different Artists make with the same materials, always amazes me the different ideas. I really enjoyed this series and seeing the materials given to you both and the very different styles and methods you used in your creations. Not that it was a surprise as I follow you and Ginger for sources of inspiration. My style is still evolving but leans more toward Ginger’s work, however, that being said, these posts have piqued my interesting in adding more sculpted dimensions to my creations. How many pasta machines do you have & have you broken any? Is there a way to make polymer clay items top-rack dishwasher-safe? Love the sharing of styles. Awesome giveaway. What a great project and such different voices can be seen. My joining on Christie’s FB neighborhood is pending and I left comments on all the other pages! 🙂 Thank you both and your sponsors for doing this fun project. Thanks for joining us Calisa! Love what you guys created! My question is about crackling! Is there a specific product for a newbie like me to start with? As in crackling the clay or a surface treatment? There are MANY options for either effect. I played around with polymer clay 5+ years ago. Since then my clay got too hard and crumbly–I couldn’t condition it even after 30 minutes with a pasta machine. I’very since discovered the Sculpey Souffle and love it, but it’s too soft for some of the finer work I wanna do. If I mix a firmer clay with the Souffle will that help firm it up? Will it bake well? Thank you, Katie and Ginger, for this fun project and for all of your tips! Absolutely you can mix clay brands, especially ones made by the same parent company. All Polyform clays work well mixed together. There are times that I find myself needing to mix different brands of polymer clay. Is there anything i need to be aware of when doing this? And how do I figure out how long to bake and at what temp? That can be tricky. I always bake at the highest recommended temp for no less than 45 minutes. What types of found objects have you used to incorporate into your clay art? What is your favorite finish for steampunk items? Love you site and appreciate all that you do for us (as always LOL). So my question is… what was your first experience with Polymer Clay? bonjour, je vous lis et je lis aussi Ginger. vous êtes des artistes de styles très différents et c’est agréable et pas étonnant de voir ce que vous avez réalisé avec les mêmes fournitures et c’est surtout très inspirant pour la novice que je suis. I just do f even have words for this! You do wonderful things in our community! What is the best type of extruder if you can’t afford much? I’d go with the Makins extruder or the Walnut Hollow Extruders. Love all of these artists! What is the one polymer tool you can’t live without? I can tell you two had so much fun!! I wish I could have been there too! Loved seeing the things you both created, and how your voices are still unmistakeable using the same supply elements. Do you know if you can get food grade polymer clay? Both of you are so talented. My question is: What is a good way to mix 2 or more colors of clay? I have a difficult time due to arthritis. Thank you! Amazing to see the similarities as well as the differences! It’s just a giveaway box that will allow YOU to work with the same supplies that we did Natalie. You don’t HAVE to post anything that you made from them, although it would be nice to see what the winner does with the supplies. What do you use to finish your projects? Thank you for the giveaway, this is amazing!!! Having taught a few classes, I am always fascinated how same tools, techniques and same coloured clay produce completely different works of art. Thank you for all of the free instruction and inspiration! I love getting to know the polymer clay world through your site. BTW, I “found” you because you were in PA and I hadn’t run across anyone else from the state! Nice to “meet” a fellow PA clayer. So glad you found me! Thank you for stopping by. I love that two people with different styles came together to create beautiful things. It must have been load of fun!!! I was a lot of fun. And I enjoyed spending time with Ginger immensely! How much fun was that?!?!?! I just love the way two people can do the same project or use the same stuff and come up with two completely different interpretations! And I love the ideas other people come up with – it amazes me! Wow! This is an awesome giveaway! Great collaboration! Love all of you! This looks like such an exciting experiment! I know in my guild, we all have several different ways to create with the same supplies. I’m thrilled to see the work that each of you produced from the same set of supplies! I’d love to try the challenge itself to see what I could do, feeding of your energy. So fun to see the interaction and the outcome of each of your work. Did either ask the other for their opinion while you worked? I’d love to have either of you sitting next to me to ask “what do you think, too much?” “What else does it need?” That kind of thing?!? Oh absolutely we did! We were constantly “helping” each other. It’s nice to go – “Hey Ginger … what do you think of this?” And have her say “absolutely” or “have you thought of…” It’s always neat to work side by side with another artist. You both looked like you had a wonderful time! I love participating in challenges where people start with the same materials; it is so interesting to me to see what we all make. “It’s all about the clay, baby!” Did you possibly get that from Christi Friesen, or what?!? I just took a 2 day class with her, and we voted “baby” is the word that she uses most often! LOL! No I didn’t – but I agree she DOES say “baby” a lot. It’s probably one of her signature words! It’s just what I felt at the time I was writing Jackie. So cool to see different styles – love them both! What is the strongest brand of polymer clay? Hello and Thank you for posting this article and giveaway! My question to you is, do you ever mix your clays? Since I began, I always mixed premo with fimo and sculpey lll, etc. I’ve never really paid much mind to the fact that some brands have different heating temps, times, and whatnot. I was just wondering if that has any effect on the end product that might be less than desirable or if you’d recommend not doing this? When I watch tutorials, I notice that many polymer clay artists usually don’t mix brands, so I was just wondering if it mattered at all or if you do this too. Thank you! How long do you think it would take you to prepare for a convention?? I teaching convention or selling convention Mary? A teaching convention would depend on how many days I am teaching. A selling convention would depend on traffic, location, and season. Hard question to answer without more information. Love your generosity! Thank you for this giveaway! You definitely should. It’s a unique and wonderful experience. In doing this wonderful collaboration,whatnew thing did you each find out about yourselves? Great question – stay tuned for the answer! It’s really apparent how this mystery box stretched you both – and you came up with such wonderful creations! Well done! What a wonderful collaboration and challenge! Indeed it would Sandy! Thanks for stopping by! Wow, what an awesome giveaway!! I would love this! What kind of wire would you suggest for use with polymer clay? It depends on what you’re trying to accomplish. Can you be more specific? What a creative challenge! I especially love the little dragon. This is am awesome way to collaborate! Thanks Lyn – we certainly DID have a good time! What is the best way to condition clay that is crumbly? Great question. I will add it to an upcoming Q&A. Fun to go on a quick poly supplies tour, thanks! Is there anything BETTER than polymer clay supplies? If there is, I have yet to find it! I have arthritis which makes conditioning clay properly hard for me. Can you suggest some tips for clayers needing help with conditioning clay? Absolutely – stay tuned for it! What an amazing collaboration! Looks like you all had so much fun!! Oh Mindy we did indeed! What an interesting collection of goodies. Sometimes the greatest things to use on / with clay have nothing to do with clay at all. Claying is truly a MIXED media art. Very interesting how different you both are. In your process and the end result. Most definitely! But so much of what we do is identical, it’s just how we do it that varies.